This will pick up where the previous one left off, and continues with the exploration of the impact of the forcible dispossession and displacement of Japanese Canadians by the government in the 1940s from the perspective of Japanese Canadians of the time. To do so, I will introduce several historical sources that are archived in the Nikkei National Museum in Burnaby. As vestiges of Japanese Canadian experiences of the bygone era, the records link us with our past, and provide us with glimpses of the complex human landscape of twentieth century Canada. As with the previous article, our protagonists will be Teiji Morishita, his family, and his business, the Ebisuzaki store located at 337 Powell Street. The store sold everything from seasonal clothes, tableware, food, dolls and traditional Japanese ceremonial goods. Teiji had come to Vancouver from his hometown in Fukuoka in 1920. He came to help with the store, which was established by his brother-in-law, Masatarō Ebisuzaki. By the time the war between Japan and the Allies broke out in 1941, Masatarō was back in Japan. Teiji was running the store with his sister, Hide Ebisuzaki and her son, Kentarō. Teiji’s wife, Sawa, was managing the matters on the home front. They had a home on Cordova Street. The oldest of their children is Nancy Morishita. I am privileged. Nancy has graciously helped me to write this article by meeting with me in person, and answering my questions concerning the history of her family and their store. The stories that she shared with me are truly remarkable. The flyer (figure 1) likely reached many Japanese Canadian homes early in 1940. It advertised Ebisuzaki store’s special seasonal sale of the so-called March dolls. March third was a special day for many Japanese Canadians. Called hina matsuri, this was Girls’ Day. Families with girls celebrated the day by decorating their homes with the March dolls or hina ningyō. The setup typically consists of a princess-like woman in a traditional kimono seated beside an equally esteemed male counterpart in an aristocratic regalia. The dolls are modeled on the glittering court culture of Kyoto in the classical Heian period. During the hina matsuri, peach flowers are presented to the dolls, and families have feasts in wishing for the healthy growth of their girls. Like the boys’ day and obon in the summer, hina matsuri is a festive occasion that punctuates the passage of time in the folk custom of Japan. Indicated in the flyer is the aspiration of Japanese Canadians to observe the cultural practices of their homeland in their family life. Printed in Beppu, a famous hot springs resort in Kyūshū, it may have resembled the ads that were circulated in Japan around the same time. The occasion was not simply a hina matsuri, but that of 1940. 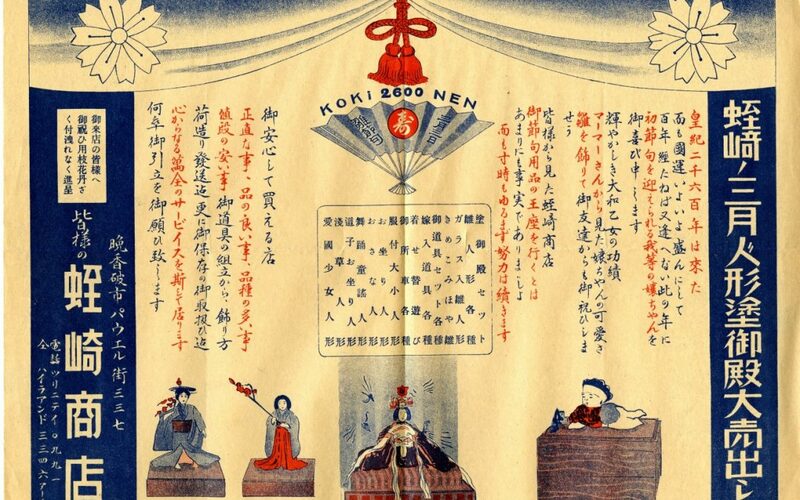 This was, as the flyer tells us, the 2600th anniversary of the (mythical) beginning of the Japanese state (hence kōki 2600). A legend had it that Jinmu, who was the first emperor of Japan, hailed from the divine realm and “pacified” the Yamato plains in central-western Japan to usher in the earthly reign of the imperial house. At the time, the anniversary was an occasion for a serious political pomp. Celebration of “our girls” in such an auspicious year, the flyer says, was surely extra special. The slogan of the imperial anniversary may seem strange and foreign, if not unpalatable to the Canadian political sensibilities of our time with awareness of the horrific human sufferings caused by imperial Japan. But that should not deter us from drawing more meanings out from the flyer. Japan’s political order at the time was built upon the mythical core of imperial authority, which in turn was naturalized and sanctified with various schemes of power and knowledge. The anniversary was part of the common Japanese language of the time. One could almost say that the veneration of the imperial house, which was a historical and ideological construct, was made into something as natural, normal, and ubiquitous as air. Beside, for Ebisuzaki, hina matsuri was a business opportunity. By selling the special dolls, the store was both creating and catering to a niche market of the Nikkei community that was steadily taking roots on Canadian soil. We can take the flyer as an entry point to the social world of Japanese Canadians around 1940. Surely, to assess how the lives of Japanese Canadians were disrupted by the harsh government measures, it is necessary to consider the rhythm and dynamics of their community before the uprooting occurred. Indeed, the flyer provides a window to the social, cultural, ad economic features of the vibrant Japanese Canadian community of the day. In the last article, I introduced the poem, “The Wealth of my Home.” Teiji wrote (or copied) it when he was living in Lemon Creek. The poem eloquently expressed the immeasurable riches of homes and it was ironic, I suggested, that he wrote it in 1946 when his home had been sold off by the government. His store, too, was shut down and liquidated. Indeed, the events of the decade quite thoroughly shattered the economy of his family. There was nothing he could do, for the fate of his family—like that of other Japanese Canadians—was dictated by the insurmountable political forces of the day; war, state directives, and the politics of racism. The Canadian state demolished the wealth of his home, and his family was thrown into destitution. Where, then, do we begin to assess the significance of their loss? This question merits thought and reflection. For our purpose, let us consider two entwined strands of inquiry. The first is economic. The loss of homes, businesses, and the various tools and equipment of livelihood was clearly a detrimental economic blow for Japanese Canadians. When the government released itself from the responsibility of caring for the properties that were seized from their owners, it determined the economic value of homes and properties based on sketchy appraisals and selling practice that took advantage of the fact that their owners were alienated from the places where they belonged. Homes and properties were sold “dirt cheap,” so to speak. The ethical problems of the government’s way of handling seized properties notwithstanding, the underlying assumption of the government was that property can be converted to dollars and cents. But can we measure the wealth of homes forcibly lost, when that loss came hand in hand with the forced dispersal, in money? For one thing, the wealth of homes was never static. It was generated and sustained through hard work and sustained efforts over the years. To assess the economic loss, then, we ought to recover those efforts, and come to terms with the economic practices that had sustained Japanese Canadian lives and community prior to the rupture of the 40s. The second is what may be considered a social loss. I am of the opinion that no monetary figure can adequately capture the loss, despair, and anxiety felt by Japanese Canadians. Subjective emotions and experiences can’t be quantified in dollars. Recently, researchers of Landscapes of Injustice, namely Nicholas Blomley at Simon Fraser University and Jordan Stanger-Ross at University of Victoria, have been problematizing the purely material approach to property. They suggest that we consider property not simply in dollars and cents or legally defined terms but as social relations and the basis of social life and existence. In other words, the meaning of property cannot be grasped if we do not account for how people relate to place. This open-minded approach to property is helpful to think of the roles that homes, businesses, other assets like fishing boats, and places played in the lives of Japanese Canadians. Instead of asking how much homes were worth, we can ask how people like Teiji and his family used their properties, and examine the links between properties and community as well as the larger society. After all, how can we understand the significance of a loss without considering how people had related to what they lost? With the above in mind, let us inquire the following questions. How did Teiji and his family run their business? What was it like to run a store on Powell Street in the pre-war era, and what innovations and strategies did they adopt? As for the social dimension, what were the relationships between the store and the Japanese Canadian community? How did the store fit into the structures of the community, and what roles did it play in shaping the living experiences of Japanese Canadians? It is probably a timeless truth that business is never easy. Teiji’s records include clippings of ads of other stores in the city that sold similar products as Ebisuzaki. There were competitors. Teiji had to stay on his feet, and astutely navigate socio-economic trends to succeed and prosper. After outlining the store’s offerings of hina matsuri related goods, the flyer spells out the motto of the store: “Honesty, Quality and Diversity in our products, and Low Prices” (shōjiki na koto, shina no yoi koto, hinshu no ōi koto, nedan no yasui koto). Calling itself “Everyone’s Ebisuzaki store” (minasama no Ebisuzaki shōten)”, it described itself a “trustworthy business where one could shop in peace” (goanshin shite kaeru mise), because it was committed to a “flawless service from the heart” (kokoro kara naru banzen no sābisu). Moreover, to lead the pack as the champion of ceremonial-goods-purveyor in the city, Ebisuzaki was “making strenuous efforts without respite” (sunji mo yurumazu doryoku ha tsuzukimasu). If there is a tinge of sensationalism in the text, that is to be expected from any effective advertisement. I have little doubt that they meant what they said, including the statement about the “strenuous efforts.” One area where they made such efforts was mail order service, which became a crucial part of the store’s business model. As Nancy recalls, when she was a child in Vancouver, the store was making deliveries to three different regions in the southwestern part of British Columbia. Her nephew, Kōtarō Ebisuzaki, who was the second son of the store’s founder, was in charge of delivering goods to the customers in Vancouver Island. Teiji made deliveries to Haney and the Maple Ridge area. The store also hired a different driver to deliver goods to customers in Surrey and the Abbotsford area. But by Nancy’s time, they were driving trucks to deliver goods. The use of trucks was likely an evolved form of delivery service that initially began as a mail-order service that utilized an outsourced carrier. Indeed, Teiji’s record include tags that were intended to be attached to parcels that were sent out to customers (MFC 2011.79.3.6-1). There are also forms that were mailed to clients which notified the latter of the shipment of goods. As seen below, the forms have typed texts with blank spaces for dates and shipment data that were to be filled in for each shipment (MFC 2011.79.3.6-2). Upon arrival, please check the contents to ensure all items have arrived safely. If there are discrepancies or errors in the order, please contact us immediately. Any delay in this matter would make it difficult for us to track-down the problem. Therefore, if there are problems, please contact us as soon as possible. A farming family in Abbotsford, for example, may have first received this letter from the store, followed by the actual items that they had ordered from the store. The store must have made catalogues of its merchandise that were sent to potential clienteles. Orders, in turn, were probably placed by mail. In fact, there is a generic order form (Ebisuzaki shōten chūmon-sho) in the Morishita Family Collection (abridged as MFC 2011.79.3.2). Anyone who buys anything from our 30,000-plus-item inventory with over $6,000 in value, will receive a raffle ticket. There are other special prizes too. In addition, as a way of thanking you for your continued patronage, we will pay for the postage of your mail orders. You can stay home and shop as though you were in the store, at no additional cost! Additional discount of 35 cents for cash purchases! Befitting the logo of the crane (tsuru, Marutsuru=crane in a circle), the quality of this rice is as timeless as it is unchanging. Rice does not get any better than this. We are striving for “thin profit and thick trust.” Taste it once and you will want to place an order! Imagine yourself in Vancouver during the heyday of Powell town. If you saw this ad, would you not want to go and check out the store, and perhaps even ask for a taste of the hyped Marutsuru rice? The raffle ticket is enticing, too. But from the perspective of the store manager, sales and promotions were necessary to attract customers and stay competitive. “Thin profit and thick trust” was the motto of the store’s founder, Masatarō. As a small family business, the store needed to achieve the difficult task of boasting a large quantity of sales without compromising the quality of the goods and services. How did the store expand sales? It goes without saying that business managers are sensitive to such factors as location, residential pattern, and class dynamics when devising business strategies. While the location of the store allowed it to attract many Japanese Canadian customers who tended to cluster around the Powell Street neighbourhood, there were many more Japanese Canadian individuals, families and enclaves in rural areas away from the city. Needless to say, for aspiring entrepreneurs, there is simply no reason to restrict their business to the immediate surrounding of their sites of operation. The broader the customer base, the better. On the other hand, if you lived in a mining or logging town in Vancouver Island or worked at a poultry farm in Fraser Valley, wouldn’t the delivery of goods to your door from a store on Powell Street be appealing? Here, we need to take into account the fact that going to the city, with the available transportation of the time, was much more time-consuming and inconvenient compared to today. Hauling loads of goods from the city to homes in the hinterland, too, would have been quite a challenge, and we are probably safe to assume that workers and families in the regions were occupied with their work and frequent trips to the city was unrealistic. In that light, Ebisuzaki’s mail order service worked both ways. It diminished the barrier of distance and allowed the business to expand its base of clientele. What kind of products did Ebisuzaki store sell? Here, again, Nancy’s memory is much helpful. As she recalls, the frontal area of the store was where clothes and apparels were sold. Browsing through the drafts and copies of the store’s ads that are found in Teiji’s records, we see that the store sold such items as women’s alpine skirt, scarfs, dresses and overcoats; men’s felt hat, neck ties and sport jackets; baby towel, pillow cases, flip flops, and many more. But truly impressive are the store’s offerings of food items. A list of items written in Teiji’s handwriting include fukushinzuke (red pickles typically served with Japanese-style curry rice), butterbur (fuki), eggplants pickled in Karashi-mustard (karashi-zuke), iidako octopus, conch horn (sazae), surume (dried squid), tsukudani (seafood, fish and vegetables simmered in sweet soy), sardine (mezashi iwashi), bonito flakes of various grades, rishiri kelp (from Hokkaidō, used to make stocks), eel, various types of Japanese tea, satsuma-age, miso, soy sauce, and so on (MFC 2011.79.3.2). As you might have noticed, Japanese ingredients were prominent in the products carried by Ebisuzaki. A lot of the stuff, like miso, bonito flakes, and rice must have been imported from Japan. This would not be surprising because the store was an importer. Other items that were imported from Japan include ceramics, such as donburi bowls, sake bottles (tokkuri), and sashimi plates. Rishiri kelp probably came from the northernmost section of Hokkaidō. But not all the merchandise was from Japan. The store also sold California and Louisiana rice, and things like lard, ketchup and Italian udon (fettuccini?!) were likely sourced locally. Who shopped at Ebisuzaki? With whom did the store strive to build “thick trust” as it purveyed goods as varied as ladies’ silk slips, sardines, miso out of its property on Powell Street? Thanks yet again to Teiji’s meticulous record-keeping practice, we have access to a sample of the spread of the customers who used the store’s mail order service. Teiji likely preserved only a selective portion of his customers’ data. We ought to appreciate the fact that he had to carry the records with him during the internment years. The records in question have been archived as “account receivables,” and they list the names of customers by region together with dollar amounts for each of them, with dates. My hunch is that these are records of the delivery runs that the store made, and the dollars indicate the total dollar values of the orders made by each customer. For instance, a record for Mission dated May 31, 1941 lists 61 customers, to Royston on August 1, 1941 lists 37, to Nanaimo on June 9, 1941 lists 10, and so on (MFC 2011.79.3.2). Below is what the record for Royston, dated June 9, 1941 looks like (original in Japanese). As Nancy tells me, delivery runs usually took several days. Teiji, Kōjirō and a hired driver drove their trucks to deliver the goods, but it was not possible to cover all the destinations in a single day. Kōjirō’s itinerary, for instance, included taking the ferry across Georgia Strait, before making rounds of the customers who lived in Vancouver Island. Along the way, they stayed overnight at customers’ homes. What this means is that they knew their customers personally, and they may have developed close relations with them. It was the investment in the trucks that allowed the store to take control of its mail order services “in house,” rather than relying on a third party carrier. The store probably did not charge fees for the delivery. Teiji could make the deliveries himself, because his sister Hide and her eldest son Kentarō stayed behind to run the store. It was a family business, and everyone contributed. One box of candies to the Nakatsus, and so on. Kyanzume refers to canned products. Yes, they were making canned tempura. Has anyone tried it? A quick search on google shows a company in Okinawa that sells them today. Regardless of whether or not we find the idea of canned tempura appetizing, the product must have been a result of the entrepreneurial efforts of C. Nishimura and her or his associates who were involved with the canning industry in Tofino. They had access to an abundance of seafood that could be transformed into marketable products via the technology of canning that they were skilled in. Perhaps they wanted to tap Ebisuzaki’s commercial links to sell their product widely. And it is certain enough that they also wanted to obtain goods from the store, perhaps ingredients for Japanese cooking. What is the significance of all this? What the above alludes to is the network of social relations that extended from Tofino on the West Coast of Vancouver Island to Woodfibre in Squamish to Maple Ridge and Mission and Clayburn in Fraser Valley. People from these regions were linked in an economic system that had its nucleus at the store on Powell Street. In mechanical terms, that system facilitated the flow of goods and money to and from the store, and it was developed and sustained by the strenuous efforts that Teiji and his family put into the operation of their business. That is how Teiji generated the wealth of his home. From a broader perspective, the store was an active player in the transpacific trade of the day, for it imported food and other items from Japan and distributed them to Japanese Canadian individuals and families who made Canada their new homes. In cultural terms, the system enabled Japanese Canadian customers to cook and eat Japanese meals, celebrate their family life in a culturally Japanese manner and purchase clothes that fit them properly, all the while, they, too, worked diligently to consolidate the foundations of their lives in Canada and build up the wealth of their homes. While the store specialized in purveying Japanese goods, it developed durable relations with non-Japanese. Among the customers in Vancouver Island was Mayo Singh. According to Kamala Yanar’s study of the Punjabi community in British Columbia, Mayo was one of the three “successful Punjabi lumber industrialists” who established the Mayo Lumber Company in the late 1910s. [i] What this means is that Ebisuzaki’s network included Mayo and perhaps other members of the Punjabi community who, like many Japanese Canadians on the island at the time, made a living in the logging industry. There are a few white names in the oseibo list as well. For example, in 1936, the store gave a scarf to Mr. Harcourt at Imperial Bank, white ham to Mr. Jamson, two pairs of silk stockings to Miss Mary, a tablecloth to Mrs. McNair, and so on (MFC 2011.79.3.2). There is also an interesting hand-written note on the back side of the Ebisuzaki delivery form. It says in Japanese, “donna mono o otabe ni naritaidesuka? Raigetsu ikou to omoimasu,” followed by the English translation, “What kind of food would you like to eat? I [plan to go to your area next month].” This looks like a script for a conversation, perhaps over a phone. We don’t know to whom these words were spoken, but they reflect the store’s effort to cater to the tastes of non-Japanese customers. Indeed, the Ebisuzaki network extended beyond the confine of the ethnically Japanese community. How, then, do we come to terms with Teiji’s loss when the store was forcibly shut down and liquidated? The government did not simply deprive Teiji and his family of the plot of the land and the building that they owned. That place on Powell Street was the scaffolding for the meshwork of social relations that spanned across the landscape of southwestern Canada. It underpinned the economic system that the family had painstakingly developed and nurtured, at least for three decades. The government ripped the pin out, and dislodged Teiji and his family from the foothold that gave them their space in the complex Canadian social terrain of the time. And what did Teiji get from the government? I have yet to find any indication that he received anything for the business other than the $322.70 that the Bird Commission, in the term used by the government, “awarded” him. To say that he was ripped off is a gross understatement. But no money can measure the social loss. When we look at the store in terms of its links with the community, we can discern the nature of the community not as a static entity that simply existed, frozen in time and space as it were, but a dynamic and living social phenomenon that was constituted by on-going social, economic, and cultural practices. Things as ordinary as shopping for clothes and cooking produced concrete social relations that shaped the contours of the community. And it was property that had made those relations possible. From this perspective, the loss of property was detrimental to the community. Needless to say, Ebisuzaki store was but one of the countless nodal points of social interactions that shaped the Nikkei community that once thrived in the coastal region of British Columbia. The government systematically and thoroughly severed Japanese Canadians from the very foundation of their social life. I thank Carolyn Nakagawa, Trevor Wideman and others at Nikkei National Museum for their help in deciphering names in some of the records that were examined to write this article. All errors, of course, are mine. [i] Nayar, Kamala E. The Punjabis in British Columbia: Location, Labour, First Nations, and Multiculturalism. Montreal: MQUP, 2012, p. 29. This article was published in November 2016 issue of The Bulletin.